Councillor Colin McGrath supports the opt out scheme for organ donation. 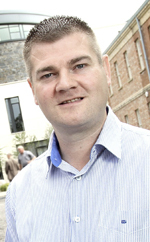 DOWNPATRICK Councillor Colin McGrath, local SDLP health spokesperson, has welcomed news that over 80% of Northern Irish people recently questioned supported a scheme whereby people would have to ‘opt-out’ of organ donation rather than selecting to opt-in. He said: “The basic message is simple… organ donation saves lives and helps people to have a quality of life they otherwise would not have. “The present system requires people to carry a donor card and to sign up to the organ donation scheme. This research suggests that an overwhelming majority of people would like to see an opt-out system – meaning people would have to make the effort to remove themselves from the list rather than making the effort to put themselves onto the list. “Advancements in medical technology now mean that where a number of organs are available several people can utilise them and have a massive positive and life-changing benefit to their lives as a result. “I would urge as many people as possible in Down District to sign up to the organ-donation scheme in its present form and to lobby where possible for the introduction of an opt-out system.”.